Yesterday's post about Twisted Wave sparked quite a few comments on Facebook, Twitter, and in my email. People wrote to ask about and or suggest other audio editing tools to use on Chromebooks. 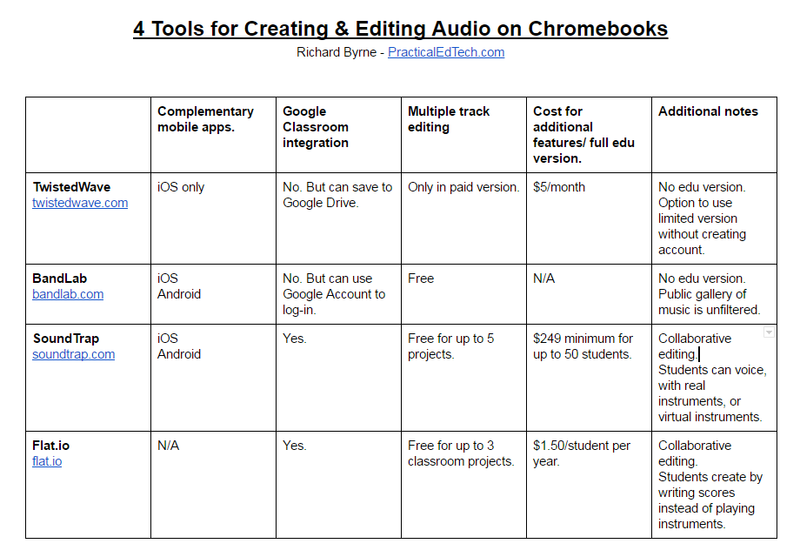 So I decided to create the following chart to compare four tools for creating and editing audio file on Chromebooks. You can view the chart here as a Google Doc or as embedded below via Box.com. Soundtrap is a fantastic tool for creating music online. The cool thing about Soundtrap is that students can use virtual instruments to create music or they can record themselves playing music on an instrument and then use that recording in conjunction with the virtual instruments in the Soundtrap environment. What makes Soundtrap stand-out from the crowd is its collaboration options. Click the "collaborate" tab in the Soundtrap editor to invite others to create music with you. Soundtrap will work in the Chrome web browser on a laptop, iPad, Chromebook, and Android tablet. In my workshops I often describe Soundtrap as Google Docs for music. BandLab is a free service that enables you to create music in your web browser or through free Android and iOS apps. In BandLab's you can create soundtracks using any of the virtual instruments that are provided. You can also speak or sing to record a track. Within the BandLab editor you can mix your tracks together to create a song. If you have existing audio files on your computer, you can upload those to incorporate into your BandLab creations. Flat.io is a little different from all the other tools on this list. Flat.io is designed as a music composition tool on which students write music on ledger lines then hear it played back to them. Students can choose to hear their music played back to them after they compose it. Topics like this one and many others will be covered in detail during the Practical Ed Tech Chromebook Camp. Discounted early registration is available now.